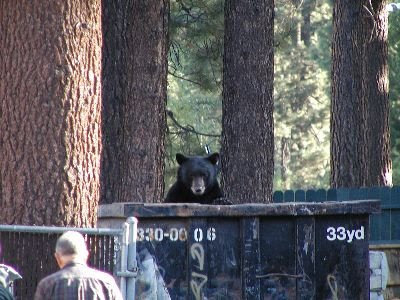 When in Tahoe, don't feed the bears. Bears, what bears? 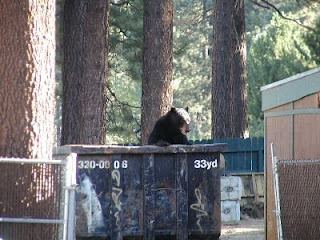 On my recent trip to South Lake Tahoe, my hotel had posted guidelines about watching out for bears, don't feed them, stay away, blah, blah, blah. I scoffed at them, thinking that bears don't like to gamble in the casino district of Tahoe, and when was the last time a bear came down into the town proper? Well hell, I was proven wrong! As I was checking out of the hotel, this guy was dumpster diving about 100 feet from my parked car.